I feel like I have become VERY domesticated this weekend. First, I made homemade ice cream and tonight I made my own pasta ravioli's. Will wanted to try making ravioli for awhile, but I doubted my ability to roll it out that thin and smooth without it tearing or sticking to the counter. I had a taste of doing just that a week or two ago when we tried our hand at making pierogies, and while they tasted totally delicious they were not at all worthy of pictures (hence the reason they didn't make it to the blog). I knew after that, that if we were going to attempt ravioli's that we needed a pasta maker. So, I picked one up at while at Bed, Bath and Beyond last weekend. It was actually less complicated then I originally expected it would be, although Will was the one using the hand crank while I just fed the pasta dough through. What a gentleman!!! Now that we know we can do it, we are anxious to try many other variations on pasta and ravioli. I'd love to hear some of your favorite pasta dishes as well! Oh and by the way - as the title implies, this was so good there was no room or should be say "shroom" for dessert! Pour flour into mixing bowl and make a "well" or pit into the center. Break eggs into the well. Slowly blend the flour and eggs until they are well blended. Continue kneading until the dough has a consistent color and texture. Form the dough into a mound shape and place on a floured table or countertop. Cover with a damp towel. Allow the dough to rest for 10-15 minutes in order for the ingredients to blend together. After the dough has rested begin form ravioli's either by hand or using a pasta maker. Finely chop mushrooms. Peel and finely chop onion. Melt butter in a skillet and sauté the onion for approximately five minutes or until transparent. Add mushrooms, garlic, cilantro and oregano and salt. Stir-fry over high heat for about five minute so that all liquid is evaporated. Reduce heat and cook for another five minutes. Remove from heat and let mixture cool. Place mixture inside the dough and create ravioli's. Place ravioli's in boiling water and boil for approximately 20 minutes until done. Melt the remaining butter. Pour over the ravioli, mix and serve. Heat milk and butter in a sauce pan until the butter melts, whisk in flour and cook over medium heat for about 3-5 minutes until thickened. Add 8 oz smoked Gouda cheese (I think the next time I will only use 4 oz of smoked Gouda. Eight ounces made it a VERY thick sauce) and 2-3 chopped sun dried tomatoes. Mix on med-low heat until cheese is melted. Pour over mushroom stuffed ravioli. You go girl making your own pasta and you ahd help! It looks great and that sauce? MMMMM! Awesome! That seriously looks de-lish. I have NEVER tried making my own pasta, but one of my favorite ravioli dishes at a restaurant is butternut squash--to die for! The sauce is laden with cream and cheesy and oh-so-good. It's a good thing that restaurant is not here where we live, so I only get to go there when I go visit my parents in Idaho! Mmm. I have never made my own pasta...but like you, it has always been something I WANTED to do...yours turned out delicious looking! Great job! Thanks to all who responded and for the kind words and wonderful compliments! They mean so much to me! The sauce was super yummy! It made the whole house smell amazing! Yep, I couldn't have done it without my helper! 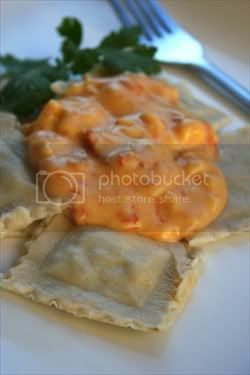 I hadn't thought about a butternut squash ravioli - I'm making a mental note of things to use as fillings for the next round! You guys would LOVE making your own pasta! It was pretty simple actually and kind of fun! (so much in fact we are making our own spaghetti later in the week! YUmmmmmmm!!! You can feed me anytime! This is just a super delicious sounding and looking creation. I'm especially intrigued by the sauce - sun dried tomatoes and smoked gouda mmm. I have a pasta maker but have yet to use it - I'm still a bit scared. arrived here via the Foodie Blogroll. I love your blog! This recipe in particular is screaming to me. I'm going to attempt to make it with homemade pasta. Wish me luck! Thanks for the kind words and for visiting! Good luck with the pasta! Make sure you keep me posted on how it turned out for you! 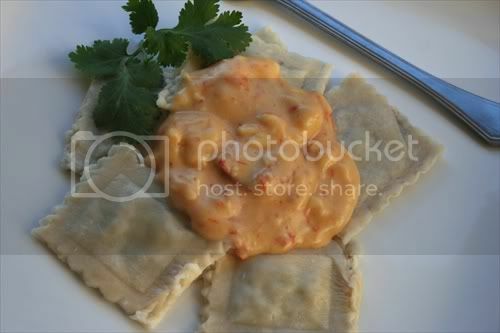 This ravioli sounds amazing, both the filling and the sauce on top! What an awesome combo! this looks like the dish from olive garden, but better! if i can somehow find a way to get the pasta premade I will for sure be making this! love your blog by the way! and you have blogged so much and its only been up 2 months! i have only about 15 posts and i have been blogging over 4 months! I want this recipe mainly because it requires homemade pasta which i absolutly love. Im so excited, thanx for sharing this. I thought it was an excellent blog, that information has been very helpful in my life, I am a desserts lover, so I really enjoyed this reading, this weekend I want to do one! Thanks for this great moment! Extreme "bakeover" -Pineapple Banana Bread .